Visit www.Standingunited.com for more information. In a time where the lines of true selflessness tend to be blurred and obscure, this cloudiness materializes from a lack of genuine care for others who can do nothing for you in return. Infection reveals itself in many different forms: pride, monetary gain, selfishness, etc. It’s extremely important we identify and recognize the amazing people who do not fall under this category. The good people at Standing United deserve such recognition. This movement is headed by founder Daniel Lansdale. He commands a whole host of tireless volunteers who assist countless alcoholics, drugs addicts, and homeless find their way back to productive members of society. They possess a network of avenues that allow for housing, treatment, counseling, sober living, jobs, etc. Their genuine commitment and passion is one that all human beings should aspire to. Their contribution truly makes the world a better place. 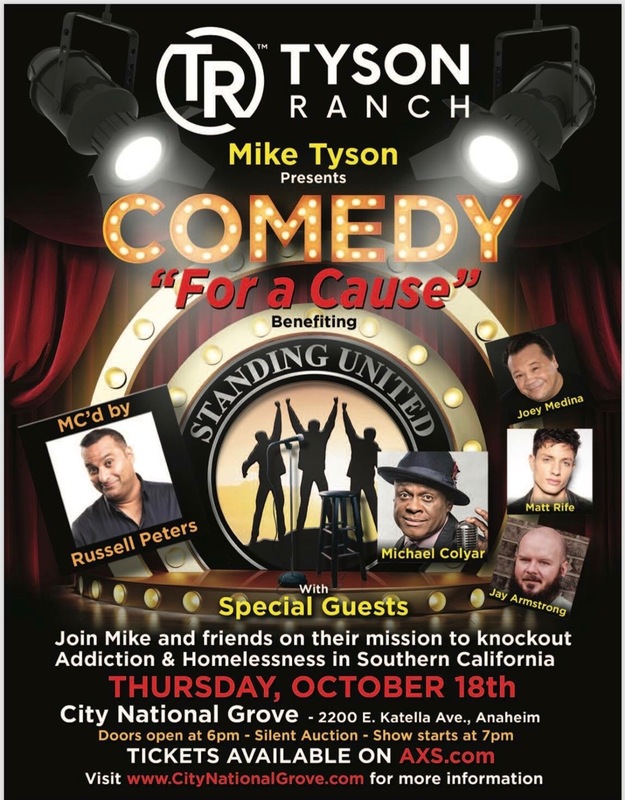 On October 18, 2018, at the City National Grove of Anaheim, in association with Tyson Ranch, Standing United will present “Comedy for a Cause”. Former Heavyweight Champion Mike Tyson and the good people at Tyson Ranch have thrown in their support with Standing United. Together they’ve created this event in hopes of raising the money necessary to continue their vision in helping millions of people restore their lives. This event will be hosted by Comedian Russell Peters coupled with a dynamic line-up of hilarious comedians. Mike Tyson will be holding an exclusive Meet and Greet before the event. There are sponsorship packages available, VIP packages, silent auction and more. Tickets will be available soon on Axs.com. The doors will open at 6 pm with showtime beginning at 7 pm. For tickets and more information please go to standingunited.com and click on Events. Follow and subscribe to www.therecover.com for updates on the event and news focusing on the addiction. If you would like to speak to someone regarding addiction please call (800) 951-1138. Individuals and families from all walks of life have been affected by the epidemic of alcoholism, addiction, and homelessness. This epidemic knows no boundaries. Its tendrils of doom no nothing of race, creed, religion or lack thereof. All of us need to band together to confront the challenges we face every day. Your support for “Comedy for a Cause” will greatly assist in combating these challenges. Please join Standing United and Tyson Ranch on this day of laughter and healing.